Vudu expanded upon its Rich Internet Application (RIA) platform today with a little music, as the popular, personalized Pandora Internet radio service is now immediately available to customers. Vudu notes that this is the first music application to be folded into the RIA platform. It joins YouTube, Flickr, Picasa, and 120 web-based video channels that are currently available for Vudu owners. And since many households have several individuals with individual tastes, the new Vudu-Pandora UI supports multiple accounts. A nice touch. Full presser follows. 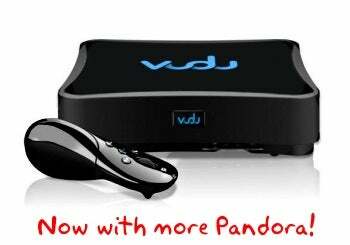 Santa Clara, CA, March 16, 2009 – VUDU, a leading provider of digital on-demand entertainment products and services, announced today that VUDU owners can get immediate access to Pandora's free, personalized Internet radio service on VUDU. Pandora represents VUDU's first music application for its growing RIA (Rich Internet Application) platform. Pandora joins YouTube, Flickr, Picasa and a selection of more than 120 channels of web based video content available to VUDU owners in their living rooms for free. "As we continue to expand our RIA platform, we look forward to bringing many more popular services like Pandora to the VUDU Service," said Edward Lichty, Executive Vice President of Strategy and Content. "Our open development environment allows us to easily release new applications in partnership with some of today's most popular services and content delivery platforms, increasing the value of the VUDU service platform for our users and partners." "Pandora is committed to enabling our listeners to enjoy their Pandora stations in all the places they listen to music; at home, at work or on the go," said Tim Westergren, Founder of Pandora. "We were impressed with VUDU's speed and the quality of development and think that VUDU is a great way for our listeners to access their favorite Pandora stations in the comfort of their living room." VUDU customers can now experience Pandora on their televisions with all of the functionality that has made Pandora the leader in Internet radio. Using VUDU's award winning remote control, VUDU customers can create new stations and personalize them by adding new variety to the station and "thumbing" songs up and down as they play. Additionally, Pandora on VUDU supports multiple accounts enabling every member of the family to play his or her own personalized Pandora stations. Pandora (www.pandora.com) is a free, personalized Internet radio service based on the Music Genome Project, which began in 2000 and is the most thorough analysis of popular music ever undertaken. Each song in the massive collection, which includes Pop, Rock, Jazz, Electronica, Hip Hop, Country, Blues, R&B, Latin and Classical, is analyzed and assessed against up to 400 distinct musical attributes (encompassing melody, harmony, rhythm, etc.) to capture its unique musical identity. Pandora uses this information to build playlists based on musical similarity. By entering a favorite song or artist, a listener is instantly launched into a personalized listening experience. Listeners can create up to 100 of these personal radio stations and refine them by providing thumbs up or thumbs down feedback. Introduced in late 2008, VUDU's RIA is a standards-based platform that makes Web-hosted rich applications and services easily accessible through the VUDU Labs area of the VUDU service. Consumers can now use the VUDU remote control to access their favorite Internet content in their living rooms, optimized for display on their HDTVs. Combining the openness and ease of development of Web applications and a lean-back user experience optimized for television, VUDU RIA will be opening to developers later in 2009.